From thermal binoculars to thermal scopes, there are hundreds of products that use thermal imaging to make night vision possible. These are popular among hunting enthusiasts security pros, and military members. But how does thermal imaging work in the first place? Let's find out! Have you ever pondered the question; how does thermal imaging work? If so, you're in the right place! This technology is pretty incredible; thermal imaging devices can detect temperatures as low as -40 degrees and as hot as to 3,600 F (2,000 C)! Naturally, there are tons of uses for this kind of tech, so it's not surprising you want to find out more on the subject. So, without further ado, let's dive on in! 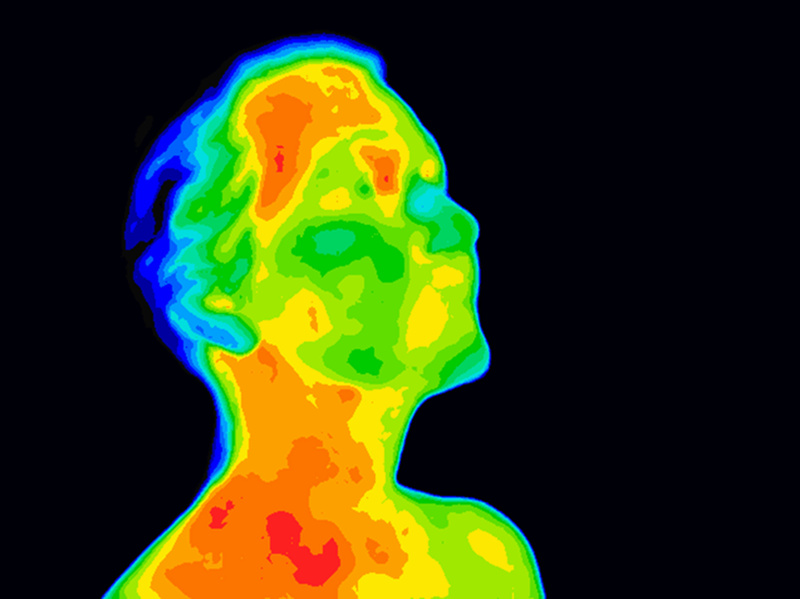 Thermographic image of a human face and neck showing different temperatures in a range of colors from blue cold to red hot. Red in the neck might indicate raised CR-P levels, this could be a sign of inflammation, and Carotid Artery inflammation which could be linked to a stroke. Thermal imaging devices were initially used by sailors to detect icebergs, way back in the early 1900s! Eventually, thermal imaging underwent numerous innovations so the military could harness this tech for military. Then eventually, thermal technology arose for both civilians and police to use in complete darkness. These are especially handy for searching for missing persons and pets and launching rescue operations.For example, the applications of thermal binoculars and thermal monocular. Put simply; thermal imaging permits you to see a visual representation of the level of heat radiating from various objects that fall within the frame of the camera. Then, each temperature is assigned a different color; this allows you to compare the various heats radiating off the variety of objects in the frame. Let's get into the nitty-gritty of how thermal imaging works. Thermal imaging involves a heat-sensitive camera that's able to detect subtle changes in temperature. Whether, you're analyzing an object as small as a singular part of an electrical circuit, or as large as an office block; there's a thermal imaging device you can utilize! The hotter an object is, the more infrared radiation it produces- simple right? This is crucial to bear in mind because thermal cameras can 'see' this radiation and then convert it into an image for us to see. To achieve this, a unique lens is necessary. These can focus and detect the infrared light secreting from everything within its view. Then, this light is further broken down and scanned by a plethora of infrared-detector elements (microbolometers). These are designed to capture and record the infrared emissions, and each pixel of the image has one. These cleverly knit together to create a complete temperature pattern (also known as a thermogram). To create a complete picture, the camera takes and processes information from thousands of different points. Fun Fact: On average, it takes roughly one-thirtieth of a second for a thermal imaging device to create a thermogram. Last but not least, the microbolometers report the temperatures and assign each pixel of the thermogram an appropriate color. Hopefully, this explanation has given you a better idea of how the tech side of thermal imagining works! Is There More Than One Thermal Imaging Device? Un-cooled thermal imaging devices are the most common of the two types. The infrared-detector components are kept at room temperature inside the camera. The device is virtually silent, immediately jumps into action, and has the correct battery pre-built into the model. Cryogenically cooled devices are way more expensive, and can't withstand rough treatment. This system is sealed inside a unit that keeps everything below 32 F (zero C). Although these devices are more fragile, they provide images with an incredible resolution which makes them worth the extra care and attention; so if accuracy is the aim, these are a sure bet! Amazingly, cryogenically-cooled systems can detect differences as minimal as 0.2 F (0.1 C) from as far away as 1,000 ft (300 m)! What's Thermal Imaging Used for? Utility and energy business: these use devices to locate where houses are losing the most heat; with this knowledge, consumers can save money on their heating bills. Police helicopters: use thermal imaging to find criminals and missing persons at night. You can detect unusual activity from a long distance, even in darkness and in adverse conditions like smoke, fog, woods, etc. This enables the police to approach unseen, and gather high-quality intelligence. Weather stations: utilize these devices to track storms, hurricanes, and other freak weather forecasts. This intel goes a long way in helping people stay safe. In medicine: thermal cameras are used to diagnose an array of ailments. Home security systems and CCTV cameras: thermal imagery is sometimes used in conjunction as part of a broader network to provide the best possible service. As you can see, thermal imaging is super useful! How Does Thermal Imaging Work: Do You Now Have a Better Idea? Do you now have an answer to the question; “how does thermal imaging work?" If you found this article useful, then we're confident you'll love the features published on our blog. Alternatively, if you have any questions, comments, or queries about this blog post or about the subject more generally, then please feel free to reach out and contact us. Or, if this blog post has inspired you to get a couple of gadgets of your own that utilize this fabulous technology, we thoroughly suggest perusing through our online store. Next Next post: Night Vision vs. Thermal Imaging: Which is Better?